A cross between Sour Diesel and Kush. A strong odor with a nice sour/kush mixture of taste. Great for chronic pain and insomnia. 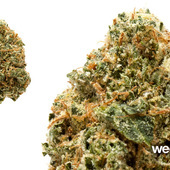 Combines the best of both strains with thick, resinous buds. Disclaimer: Review is based on the personal opinion of IE420Patient. Batches of the same strain can produce different results due to many factors thus, as with any "review" use as a guide, not as pure fact. Looks: Nice tight & "crunchy" lime green marijuana nuggets to the touch with a heavy coating of trichomes. Smell: Pine and lemon concentrate juice. Taste: Similar to it's smell; rich, sour and lemony with hints of fuel. * The last time I had a strain similar to Sour Kush was back in April 2010, when given a sample a Super Sour Kush to try. Lemonheads rejoice! 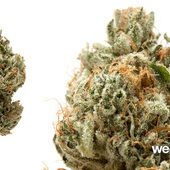 If you like a dominant smell and taste of lemons, this strain will not disappoint. The combination of pine and lemon scents produces a smell that is very "sour." A lemon taste hits the mouth when drawing from bong w/o lighting the bowl yet. The smell is like the plastic lemon/lime filled with liquid concentrate. A bit of stench was left behind when breaking up a marijuana nugget too. This batch of Sour kush looked as if it was dusted with powder sugar. This strain produces lots of smoke. I was able to produce big exhales of smoke. I immediately noticed smaller bowl hits were better vs. packed larger bowls due to how this strain burned so "rich." Large bowl rips had me coughing pretty hard with my large bong (holding my coughs once again in the included video) and large bubbler hits were to rich with bowls in both pieces immediately very resinous after a hit. Sour Kush provided me with a bit of mental clarity, but more than once I was shut down with a crash or came down feeling lazy. Pain relief was excellent (produced a bit of full body tingle) with a slight bit of "headiness" right behind the eyes along with the sensation of pressure around the front of my head. My eyes did get low and turn fast. Once closed, I did not want to open my eyes up; very couch locking. If not couch locking, the buzz effect turns to a more super heavy body high with extreme "tingle;" somewhat like the feeling ants are crawling all over you. If trying to lose weight or watch your weight, be careful with this one. I got the munchies bad, very bad. I literally was the poster child for saying; "... ate house and home." I ate like crazy. Late nights were bad. It was very hard to deter my sweet tooth cravings late night if medicating with Sour Kush.